ALS, 2pp. 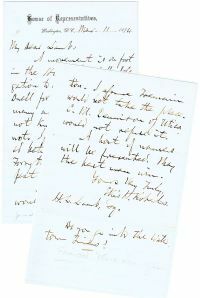 Mar 11, 1874, to H.L. Lamb, Printed House of Representative, Washington, D. C. Letterhead ref to political election or appointments My Dear Lamb: A movement is on foot in the House to get the delegation to sustain R. Holland Drell for Hall’s place. How many are committed, I do not know. Several are not. If Troy should he …between Townsend and Forsyth, would not the depart of both be inevitable! H. Boardman Smith would not be a bad selection. I would not take the place. C M. D… of Utica would not refuse it. A host of names will be presented. May the best man win. Yours Very Truly, Elllis H. Roberts H.L Lamb, Esq. Do you go with the Watertown lines?